The Sutra Pen is as discreet as they come. Powered by a long-lasting lithium ion battery, it is designed to work with concentrated oils in a quick and simple manner. The pen is also lightweight, user friendly and comes in a range of desirable designs. 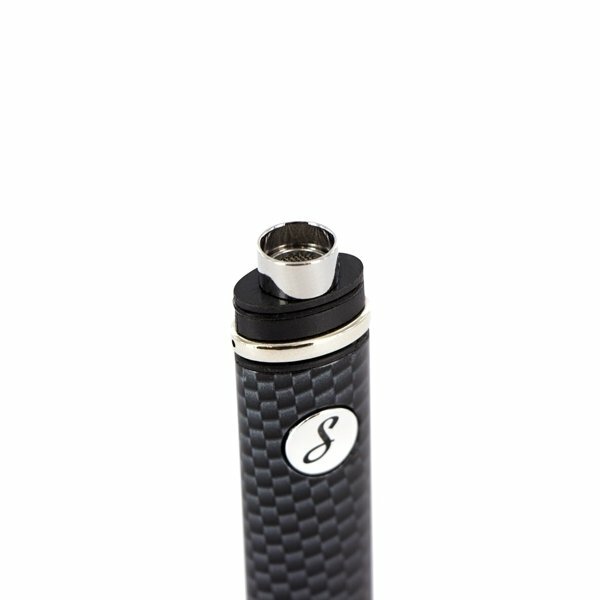 Newcomer to the portable vaporizer game, the Sutra Essential Oil Vaporizer is an extremely small and compact Vape pen that is designed specifically for concentrated essential oils. Before actually using the Sutra Pen you need to ensure it's fully charged. This is achieved by plugging the USB Charger into the provided AC adapter (no butane gas required). The indicator light found on the USB charger will change from red to green signalling the lithium ion battery is fully charged. Now that the battery is fully charged, remove the mouthpiece cover and place your concentrated oil into the filling chamber. Once satisfied with the amount, re-insert the mouthpiece back in place. At this stage the Sutra Pen is ready for action, press down on the power button for 5-10 seconds and begin taking slow, steady tokes. Designed with an ultra modern and sleek concept in mind, the Sutra Pen is most definitely aesthetically pleasing. Measuring in at only 4 inches in length and 3/8 inches in Diameter, means it will easily find it way into your palm or pocket with ease. -The vape efficient LED light that acts as an alert system, rapidly blinking when it needs to be charged. -Stainless steel heating chamber, which accommodates for ample amounts of essential oil to be vaporized. -Built-in automatic shut off setting.